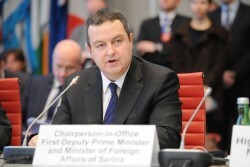 Serbian Foreign Minister Ivica Dačić today outlined priorities for the 2015 Serbian Chairmanship of the Organization for Security and Co-operation in Europe at the first Permanent Council meeting of the year in Vienna. He pledged to seize the opportunity given by the 57 participating States to rebuild trust and confidence in order to create a positive agenda for the future, according to the motto of the Serbia Chairmanship. Dačić called on the representatives of the OSCE participating States to join forces in these very difficult times for the Euro-Atlantic and Eurasian regions and for global security. “The peace process is essential. Dialogue and compromise, peaceful resolution of disputes, confidence-building, solidarity, responsibility and co-operation were never this important”. He added that the OSCE’s commemoration of the 40th Anniversary of the Helsinki Final Act will remind the world of the breakthroughs of the past. “The situation in and around Ukraine continues to pose a serious threat to the stability of the region and beyond. The horrific attack of two days ago in eastern Ukraine, in which several people were killed and wounded, is yet another proof of why we must do our best to come to a resolution of this crises”, Dačić said. It was crucial to invest all efforts to achieve a sustainable ceasefire and full cessation of hostilities, he added. “I can assure you that Serbia is ready to act as an honest broker in the peace process and utilize the advantage the OSCE offers. Impartiality and transparency is our way”. He supported the work of the Special Monitoring Mission (SMM) to Ukraine, which played a key role in the implementation of the Minsk documents and had proved to be invaluable in terms of the international response to the crisis. Dačić stated his belief that there was room to move away from the status quo in relation to protracted conflicts in the OSCE area and pledged that high-level contacts between the parties will continue. “Recent events in France have unfortunately highlighted once again that the international community should remain vigilant in the face of existing and emerging terrorist threats,” said Dačić. Freedom of expression and protection of journalists need to be safeguarded, he added. Dačić also emphasized that the Chair’s priorities will include the rule of law, freedom of expression and freedom of media, including safety of journalists, freedom of assembly and association, protection of the rights of persons belonging to national minorities and promotion of tolerance and non-discrimination. Dačić also stressed the importance of fostering increased participation of youth in political life and decision-making processes, continuing to support the innovative practice of the Switzerland Chairmanship.